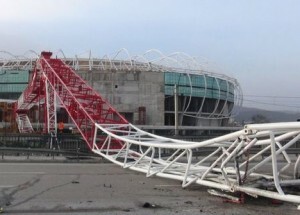 A large crawler crane working on the new Timsah Arena Stadium, in Bursa Turkey came down over the weekend in strong storms, killing the driver of a passing car. The crane boom, luffing jib and derrick mast went over the back of the machine and across the Bursa-İzmir highway, with the jib striking a passing taxi, killing its driver- Fatih Demirkıran. A woman passenger was seriously injured and is in a critical condition in hospital.